I get a kick out of compiling (and reviewing) my annual wish list of places I’d like to visit in Portugal over the coming year. It’s becoming something of a ritual and helps me to get organised; my agenda is fast filling up. Some of these destinations and activities are definites, others are still in the idea phase. 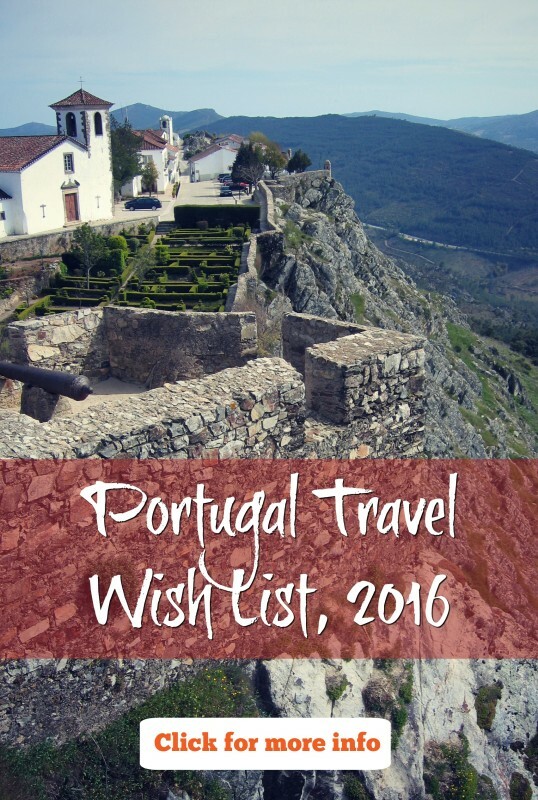 I hope you find inspiration within my 2016 Portugal travel wish list. Update, December 2016: It’s time to revisit this list and see where I managed to get to. One of the northernmost cities in Portugal, Chaves has been on my radar for some time. I’ll finally be visiting it this weekend after attending a couple of food related events in nearby Boticas, one of them being the Pork Festival. Boticas is also home to the vinho dos mortos (wine of the dead). And yes, there is a story behind that! From what I’ve seen and heard, Chaves promises to be an attractive riverside town with interesting architecture, including a much-photographed bridge and the old castle keep. Since it’s also known for its thermal springs, perhaps I should look into spa treatment in case the wintery weather makes walking around less appealing. Update: I didn’t get snow, I got torrential rain for 2 days. I sat in my car in Chaves for a while, wondering whether or not it was worth getting out. In the end, I decided that exploring Chaves’ charms would be best left for another day. I’m updating a Porto travel guide at the moment, which gives me a perfect excuse to revisit and check out the latest additions to this ever-changing city, such as the World of Discoveries, an interactive museum about the daring voyages into the unknown undertaken by Portuguese navigators back in the 16th century. Update: I made it to World of Discoveries, which was a fun way to learn a little about ancient explorers, especially Vasco da Gama. I’ve got a growing list of restaurants to sample and a museum or two that I haven’t had chance to explore yet. All this research will go towards making the Porto itinerary I’m putting together as up to date and useful as possible. Owned by Bacalhôa Wines, the same company whose impressive art collection and winery I visited in Azeitão, Buddah Eden is the biggest Oriental garden in Europe and somewhere that’s been on my Portugal travel wish list for a long time. As well as gigantic statues of Buddah and a variety of pagodas, there are 700 terracotta soldiers and a whole host of artistic oddities to be discovered within the landscaped grounds. And, of course, there’s wine. Update: Despite additional recommendations, this is still on my to do list. Next year… I did, however, visit Aliança Underground Museum and Winery, part of the Bacalhôa group. Worth a visit if you’re in northwest Centro de Portugal. I’m looking forward to spending 3 weeks in Lisbon this spring which will give me the opportunity to delve even deeper into the city and surrounds. I’ll finally get around to visiting places like the Palácio dos Marqueses da Fronteira, famous for its azulejos and gardens but with restricted visiting times. As with Porto, I’ll be using my time to research and refine itineraries and will let you know when they’re available. 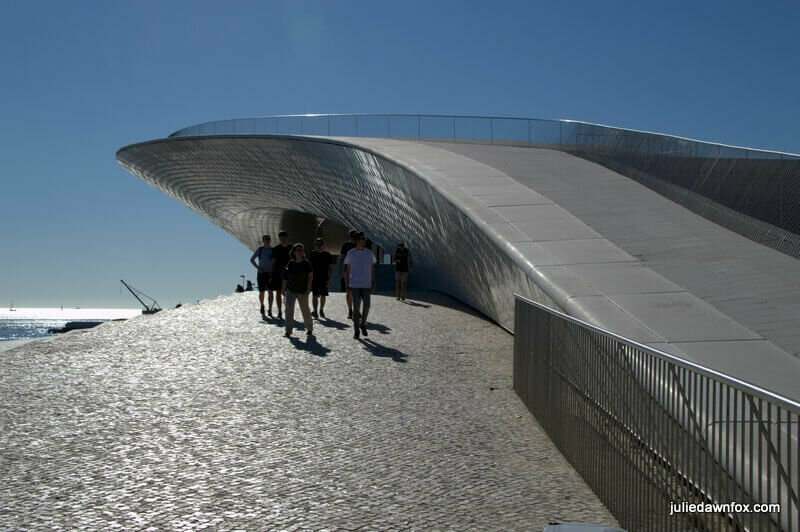 I’ll be visiting again later in the year once the futuristic-looking Museum of Art, Architecture and Technology opens in Belém, provisionally in October. Update: It is open but will also have to wait until 2017 before I get chance to see it, as will the Palácio da Fronteira! Some of you already know that I spent one day walking the Portuguese Way of St. James between Ponte de Lima and Cossourado. Since then, I’ve been wanting to go back and try the full route, or at least several days of it. Although I could do it alone, it’ll be far more fun with company and my friend Dori is as keen as I am so we’ll be donning our walking boots in April and May. Update: We did it! 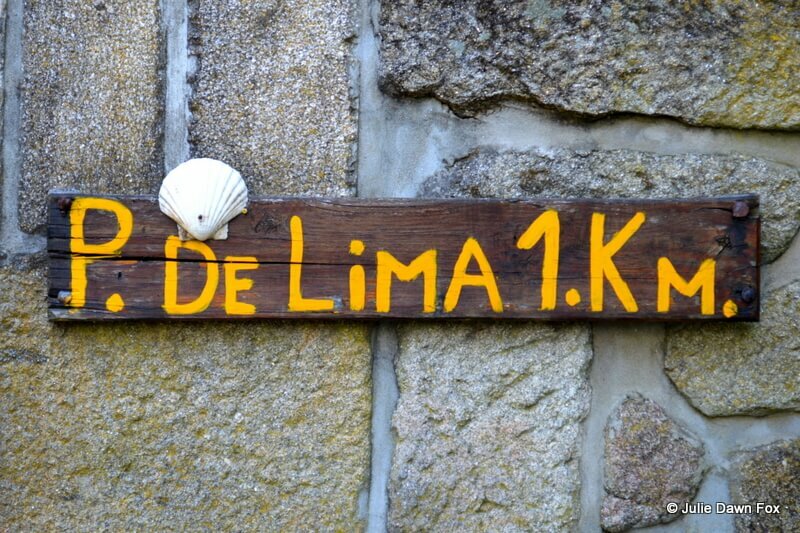 Dori and I completed the Central Camino between Porto and Santiago de Compostela. I also walked the stages of the Coastal Way of St. James to the point where it merges with the Central Way. After the wonderful introductory experience I had of the Azores last year, I’m eager to return and will keep my fingers crossed for less fog. From what I’ve seen so far, the wild, green northern side of the islands appeal to me and I’d like to build in some time to just spend a few days doing nothing but recharging my batteries as well as a few more days walking and exploring. I’m told that October is a good time to go so I’ll see what happens. Update: Sadly, I have been too busy to manage another trip to the Azores this year but I am just as keen to return. 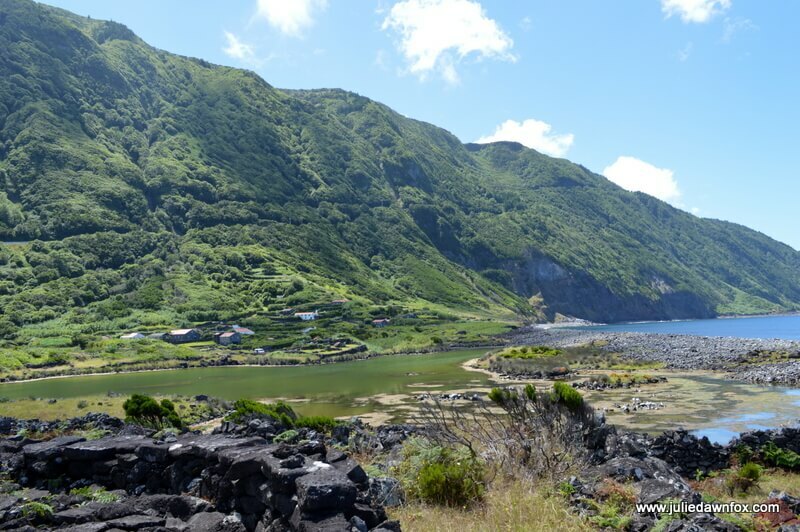 Fajã dos Cubres, São Jorge island, Azores. The same is true of Madeira, an island I fell in love with and long to return to. The way things are shaping up so far this year, I’m not sure I’ll be able to fit in a trip. Sadly, I will definitely miss famous the Carnival parade in February and probably the Flower Festival which takes place in April this year (7th to 13th). Update: Again, his has had to be postponed. 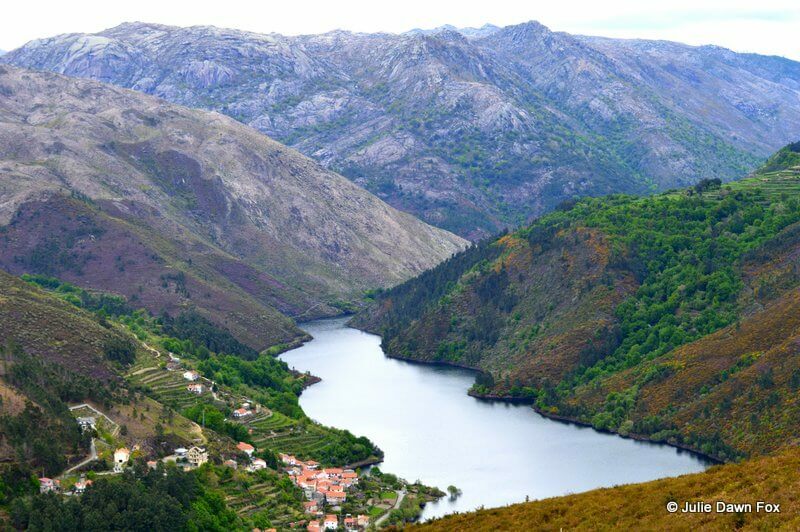 I’ve been doing some work for a tour operator who specialises in the north of Portugal and it’s looking likely that I’ll be revisiting the Peneda-Gerês National Park at some point this year to help develop one of their programmes. It’s such a beautiful area and there’s so much of it that I’ve yet to discover so I’m already looking forward to that. Living so close to Coimbra, I sometimes forget to mention it on my wish lists. Surprisingly, there are still a few places in Coimbra that I haven’t actually been inside. I finally visited the upper floors of the Municipal Museum on Rua Ferreira Borges last week and was pleased I did. If you like art, you’ll enjoy the 1st floor exhibition which tracks Portuguese art from early religious work to more contemporary pieces, albeit in rather a cramped space. The upper floor has an astonishing collection of Chinese ceramics from various dynasties. All for less than 2 euros! 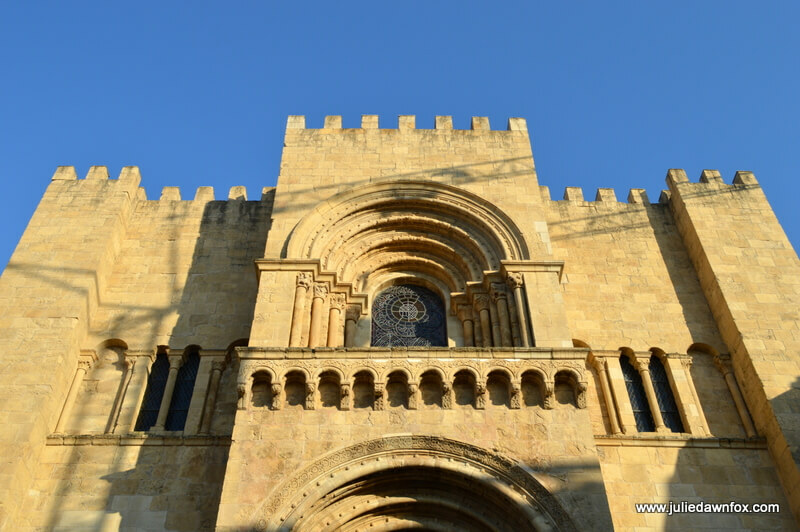 Next to cross off my list are the interior of the 12th century cathedral and the Santa Clara-a-Velha monastery as well as the Fado Guitar Museum. I’m also planning to update my recommendations for places to eat and drink in Coimbra. Update: Mike and I visited the monastery on probably the hottest day of the year. It’s a beautiful building and museum and the air conditioned café-restaurant was a godsend. I am still working on my restaurant recommendations – there are a couple of places I want to check out before I do. 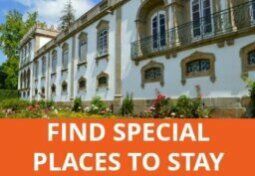 In the meantime, I wrote a guide to Where To Stay In Coimbra that may encourage you to spend more than just a day here. Since the Algarve is one of Portugal’s most popular tourist destinations, it makes sense for me to spend time there as often as possible so that I can research articles for my own blog and other publications and companies. 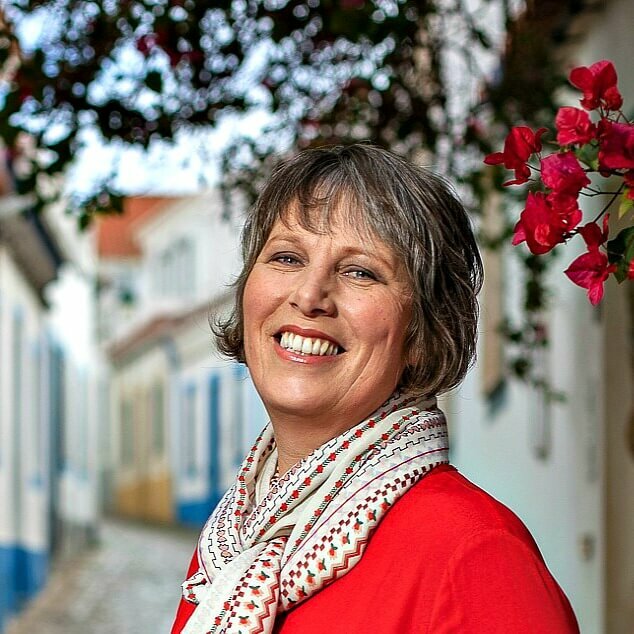 I prefer to steer clear of the crowds and overly touristy places – there’s plenty of information about those already – and will be concentrating on more things you can do in the Algarve away from the beach. Update: Argh! I can see now how overly-ambitious my list was. Both the Algarve and Alentejo regions are still due another visit in the near future. By no means least is the Alentejo region. 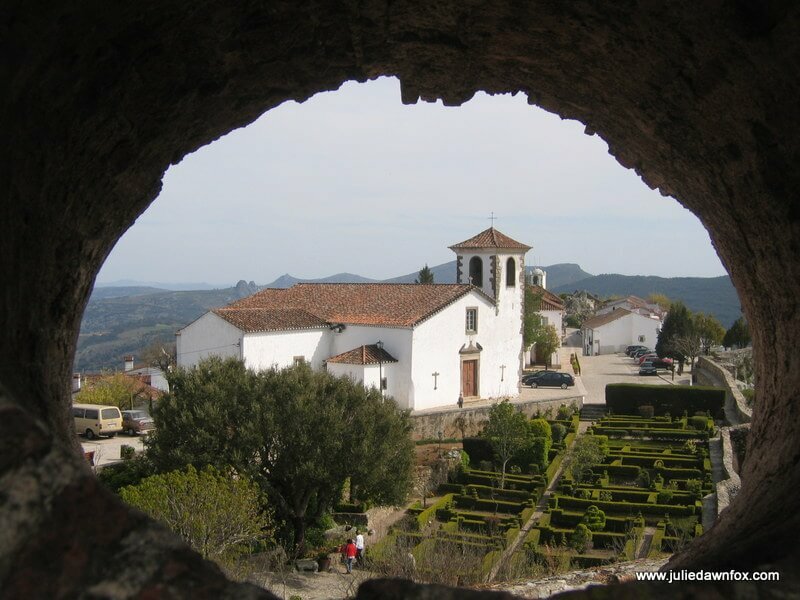 If I can find the time, I’d love to head east to revisit the castle towns of Marvão and Castelo de Vide. I’m intrigued by Portalegre’s tapestry museum, too. 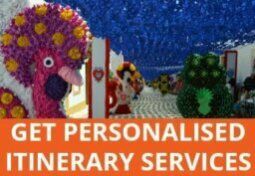 What are your Portugal travel plans or dreams for 2016? If you are in Marvão in Autumn try the Chestnut Festival. Just outside Castlello de Vide there is a circular drive that takes in Dolmens (one is 7ft tal! ), Roman olive presses medieval graves and more, all without getting out of the car. (Most of the sites are actually on private land, but you can see them from the road) There is also a very pretty reservoir and recreation área. Not far away is the largest standing Menhir in Iberia, but it takes some finding, as do many of the dolmens and other sites. There is also another event in Autumn, the Mossa something that is a joint event between Marvão and Badajoz to celebrate the time of the Moors. One week the events happen at the Alcabazar and Plaza Alta área of Badajoz old quarter, the next they are in Marvão. Haven´t been myself but it looks fun. For spookier things Campo Maior has a chapel made entirely of bonés, so do Elvas and Évora. Ammaia isnt always open; if I remember, when I am next over that way I will try and see if I can get opening times. Walking and driving in the Sierre Mamede is stunning. Camp Maior also has the Delta coffee museum . Again, I haven´t been but it has been highly recommended. 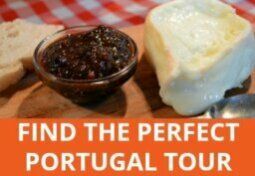 I am resisting the urge to mention all the delights on My side of the border , as this is a site dedicated to Portugal after all. But it is very easy to flip from one side of the border to the other, sometimes hardly noticing. Like the Moorish festival there is a lot of co- operation around here, Oh and if anyone is a market freak, like me, Portalegre has a big one on the 3rd Sunday of the month, but it tends to be a bit samey. My favourite is Esperanca on the last Sunday of the month, where you can literally buy anything and everything, from a live goose to a gargoyle and you never know what you might find. Just down the road from the market there is some ancient rock art. But without the market Esperanca is a blink and you have missed it kind of place. There are many of them around here on the Portuguese side. Hi Shelagh, Thanks for all your suggestions. I am definitely heading over to this area at some point this year. It’s been too long! This year I will be visiting the Azores and also some days in Porto. Looking forward to that! Keith, thanks for info. Have been to Tavira end of the Algarve for several years now. If you get hold of a car, drive east along N125 just a few kms and turn towards coast at Cacela Velha (which is worth visiting but may be some tourists). Turn right just before village and follow signs towards Fabrica. Lovely quiet beach area (esp. in March), coffee shop and great fish restaurant. (If you look it up on Google Earth, their on-the-ground view was taken on a holiday in August and is FULL of cars and people. In March and October we’ve been there with only a handful of other people around. Lovely spot.). Julie, new subscriber and delighted to have found your blog. Our next trip to Portugal is early March. Info on the Via Viagem zapping option in Lisbon will be particularly useful. We will be staying for 4 days in Castelo de Vide. Hi Richard, Keith has already given you a heads up about Zapping using the Viva Viagem cards. Here’s more info if you need it: https://juliedawnfox.com/2013/11/01/z-zapping-best-way-paying-public-transport-lisbon/ Have fun! My husband and I have been going to Braga for the past two years. This time we want to go to Vianna on the way. Good choice, Elizabeth. Viana is gorgeous! One visit in 2013, two visits in 2015 and another one is planned for March 2016. Guess that we like Portugal! First trip was a road trip – flew in and out of Lisbon, then used buses or trains to get to Sintra, Evora, Tavira, Sagres, Lagos and then back to Lisbon for the flight home. Second visit was a week in Lisbon with side trips to Sintra, Belem, Estoril and Cascais. Third one was to Lisbon, Porto, Douro Valley, Viana Do Castello, Aveiro, Coimbra and then back to Lisbon for the flight home. Next one is to fly in and out of Faro and a week’s stay in Tavira at Pousada Convento da Graca (courtesy of the Over 55’s rate found on Expedia’s website). Plan is to eat local and travel around area & towards Spain on buses and trains. May also head to Spain via ferry to do some time travel (one hour time difference each way – silly but fun thought!). Still thinking about a few other trips for 2017, 2018 and 2019! Glad to see you’re making the most of deals and the chance to explore fully. Have a great time in the Algarve! So pleased to find your blog today. I regularly visit Portugal and am inspired to create artwork based on so many of the beautiful places there like Olhao and Porto especially. Have just started to follow you. ? Welcome! I hope you continue to enjoy my blog, and Portugal! If you get to Marvao, make sure to visit the Roman site of Ammaia nearby – interesting site and great little museum! Thanks for the tip, Sue. Will do. Hi Julie, I’m doing the same this year hoping to see more of Portugal, with the view of moving in a few years if all goes to plan. Have a great 2016 and may your travels go on as planned!